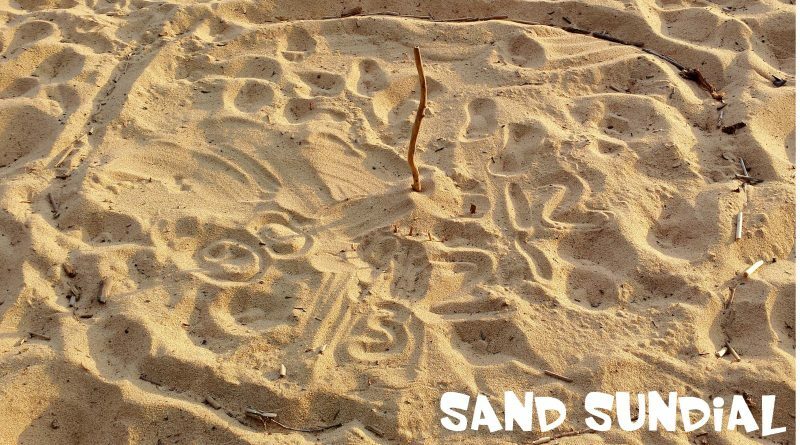 Lazy days at the beach mean splashing in the water, building sand castles and… sundials? They require minimal materials (at the very least you need to find ONE stick, oh and sand). A sundial uses the sun to tell time! Although, when it’s summertime, the last thing your kids want is YOU telling them the time, unless of course it’s snack time but definitely not bedtime. But when it’s a fun project it’s worth it! The task would have been super easy if only we could stop all the dogs from walking through our “construction” site, we have the paw prints in the sand to prove that we were only moderately successful. For 8 hours we watched our sundial in action as the sun rose in the east and traveled across the sky to finally disappear in the west. And when the sun isn’t shining, there are no shadows to see. There is a reason we don’t call these night-dials, or dark-dials. During these hours, we will need to rely on our regular clocks and watches. Or just go to bed! Or just forget time completely. My kids had fun building the sundial, and it was a perfect task when attention spans are short. A quick glance at the dial from time to time offered just enough excitement but didn’t take away from doing all the other fun beach activities! Mind you, we were on vacation and we didn’t get organized to create our sundial until noon. Yes, the lazy days of summer were hitting us hard and bedtime kept creeping later and later. Here is our sundial on the beach! (keep reading to find out how it works, how to make your own, and other fun things to try). As the sun shines on the stick in the center of your sundial, a shadow is cast. Depending on where the sun is located in the sky will determine where that shadow line will appear. During the middle of the day, the sun will be high in the sky, and the shadow line will be fairly short. As the days goes on the sun gets closer and closer to the horizon, and the shadow will get longer (Compare the shadow at 12 noon and 8 o’clock in our YouTube video above). A shadow is formed when an object (like our stick), blocks the light (like that coming from the sun). The light path has been stopped by that object. And because the light cannot get through the object, the ground (or surface) appears dark because the light never made it there. Sorry light, this road is closed! That stick that we found on a beach, isn’t JUST a stick, when being used to tell time, we call it a gnomon (some folks pronounce it No-Mon and others say No-Men, either way that G is silent, silly G). It may look like the sun is moving across the sky but in fact we are the ones moving. Earth is the one rotating! Earth rotates one complete cycle once every day. Pick a day where the sun is shining and the clouds are minimal to maximize shadow production! We smoothed out the sand to make it as flat as possible. We used our fingers to draw the outline of the circle. We added small sticks and dried reeds that we found lying on the beach to outline our circle. We found a stick. The kids insisted on a short thin stick, only to realize around 8 o’clock that a longer one would have been better. (Sometimes you need to let kids make and learn from their choices). At the top of each hour, we marked the location of the shadow. And we looked up in the sky to see where the sun was shining. Was it WAY up high, or was it closer to the horizon? You can make your own sundial out of just about anything. As long as you can put a pointer/stick (the gnomon) in the center and the sun can cast a visible shadow, you are good to go! You could draw a circle on the driveway with some sidewalk chalk. And prop up a stick with some rocks. You could make one with a paper plate and a straw. Get your kids to make shadows outside in the natural sunlight, or using a flashlight. Were is the shadow forming? Does its size change as you change where the light is coming from?